Thank you for inviting me to meet you at the end of your conference dedicated to the implementation of the Pastoral Guidelines on Trafficking in Persons, published by the Migrants and Refugees Section of the Department for the Human Integral Human Development Service, and approved by me. I thank Fr. Michael Czerny for the words he addressed to me on behalf of all the participants. "I came that they may have life and have it abundantly" (Jn 10:10). In this sentence of the Gospel of John the mission of Jesus is summarized: to offer all men and women of every age life in fullness, according to the plan of the Father. The Son of God became man to indicate to all human beings the path of realization of their humanity, in conformity with the uniqueness and unrepeatability of each one. Unfortunately, the present world is sadly characterized by situations that hinder the fulfillment of this mission. As evidenced by the Pastoral Guidelines on the Trafficking of Persons, "our times have marked a growth of individualism and egocentrism, attitudes that tend to consider others in a merely utilitarian perspective, attributing to them a value according to criteria of convenience and advantage personal »(n. 17). It is essentially that tendency to commodification of the other, which I have repeatedly denounced. Trafficking in persons is one of the most dramatic manifestations of this commodification. It, in its many forms, constitutes a wound "in the body of contemporary humanity",  a profound scourge in the humanity of those who suffer it and those who implement it. Indeed, trafficking disfigures the humanity of the victim, offending his freedom and dignity. But, at the same time, it dehumanizes those who perform it, denying them access to "life in abundance". Finally, trafficking seriously damages humanity as a whole, tearing apart the human family and even the Body of Christ. The trafficking - we said - constitutes an unjustifiable violation of the freedom and dignity of the victims, constitutive dimensions of the human being wanted and created by God. For this reason it is to be considered a crime against humanity. And this without doubting. The same gravity, by analogy, must be attributed to all the contempt of the freedom and dignity of every human being, whether he is a compatriot or a foreigner. Those who are guilty of this crime cause damage not only to others but also to themselves. In fact, each of us is created to love and care for others, and this reaches its climax in the gift of self: "No one has greater love than this: to give his life for his friends" (Jn 15, 13). In the relationship that we establish with others we play our humanity, approaching or moving away from the model of human being wanted by God the Father and revealed in the incarnate Son. Therefore, every choice contrary to the realization of God's project on us is a betrayal of our humanity and renounces the "life in abundance" offered by Jesus Christ. It's taking the ladder downhill, going down, becoming animals. All actions that aim to restore and promote our humanity and that of others are in line with the mission of the Church, as a continuation of the saving mission of Christ. And this missionary value is evident in the struggle against all forms of trafficking and in the commitment towards the redemption of the survivors; a struggle and a commitment that also have beneficial effects on our own humanity, opening the way to the fullness of life, the ultimate end of our existence. Your presence, dear brothers and sisters, is a tangible sign of the commitment that many local Churches have generously assumed in this pastoral field. The numerous initiatives that see you on the front line in order to prevent trafficking, protect survivors and prosecute offenders are worthy of admiration. I feel I must express special thanks to the many religious congregations that have worked - and continue to operate, even online, as "avant-garde" of the Church's missionary action against all forms of trafficking. Much has been done and is being done, but much remains to be done. Faced with a phenomenon as complex as it is obscure, such as human trafficking, it is essential to ensure the coordination of the various pastoral initiatives, both locally and internationally. The offices in charge of the local Churches, religious congregations and Catholic organizations are called to share experiences and knowledge and to unite their forces, in a synergistic action that concerns the countries of origin, transit and destination of the persons being trafficked. To make its action more adequate and effective, the Church must know how to make use of the help of other political and social actors. The stipulation of structured collaborations with institutions and other civil society organizations will guarantee more incisive and lasting results. I sincerely thank you for what you are already doing on behalf of so many of our brothers and sisters, innocent victims of the commodification of the human person, we say the word, without shame: "the commodification of the human person". We have to say it and underline it because this is the truth. I encourage you to persevere in this mission, which is often risky and anonymous. Risky also for the laity, as much, but also for the religious. It's risky even inside the congregation, because they look at you wrong! The nuns say yes. It's risky, but you have to move on. It is anonymous, but precisely because of this irrefutable proof of your gratuitousness. Through the intercession of Saint Josephine Bakhita, reduced to slavery as a child, sold and bought, but then liberated and "flourished" in fullness as God's daughter, I pray for you, I invoke on all of you and on those who are committed to fighting against treats abundant blessings. I assure you of my memory. I pray for you. And you, please, don't forget to pray for me. Cf. 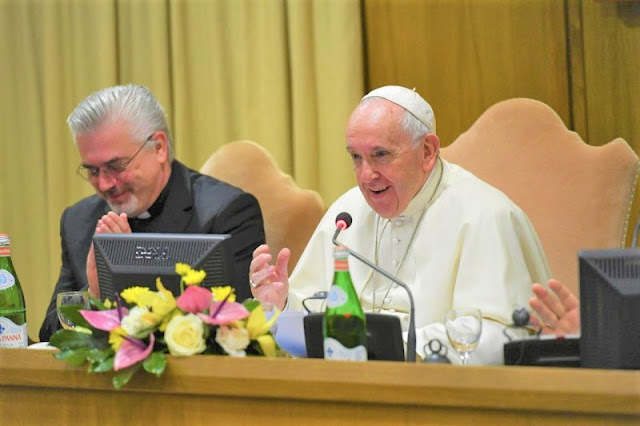 Address to the participants in the Plenary Assembly of the Pontifical Council for Culture, 7 February 2015; General Audience, 22 April 2015; Apost. ap. postsin. Amoris laetitia, 54; Speech to members of the Anti-Mafia Parliamentary Commission, 21 September 2017. Address to the participants in the International Conference on the Trafficking in Human Persons, 10 April 2014. Cf. Speech to a group of new Ambassadors on the occasion of the presentation of the Credentials Letters, 12 December 2013; Speech to the Delegation of the International Association of Criminal Law, 23 October 2014; Message to the participants in the Conference on the Trafficking in Human Beings organized by the "Santa Marta Group", 30-31 October 2015; Speech to the participants in the Human Trafficking meeting promoted by "RENATE", 7 November 2016; Words to the participants in the Fourth World Day of Prayer and Reflection against the Trafficking in Persons, 12 February 2018; Pre-Synodal meeting with young people, 19 March 2018; Video message to the participants of the II International Forum on Modern Slavery, 5-8 May 2018; Speech to the participants in the Plenary Assembly of the Pontifical Academy of Sciences, 12 November 2018; Greetings to the members of the Galileo Foundation, 8 February 2019.